What’s the Project? 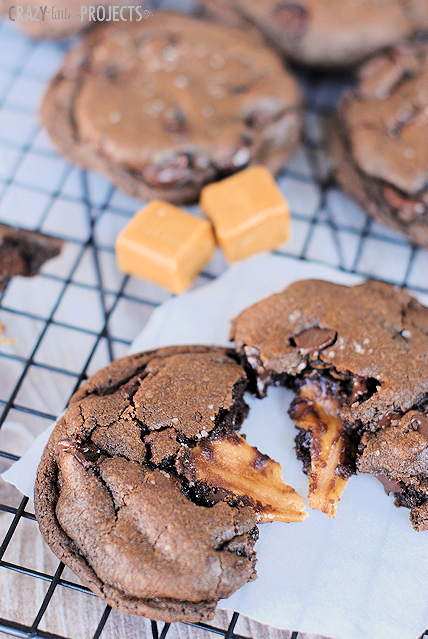 These chocolate salted caramel cookies are as good as it gets! The perfect chocolate chocolate chip cookie stuffed with caramel and sprinkled with salt. They are soft and chew and taste amazing! Cookie making is my favorite! (In case you couldn’t tell from this crazy post.) 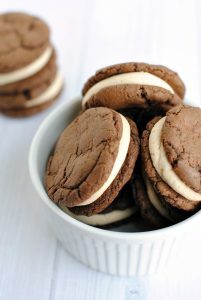 And this just may be my new favorite cookie recipe! I always make cookies using this base-it’s a chocolate chocolate chip cookie that is the perfect consistency. It’s a chocolate chocolate chip cookie that is really soft and chewy and then it has a caramel stuffed right inside. It’s perfect! You want one now don’t you? 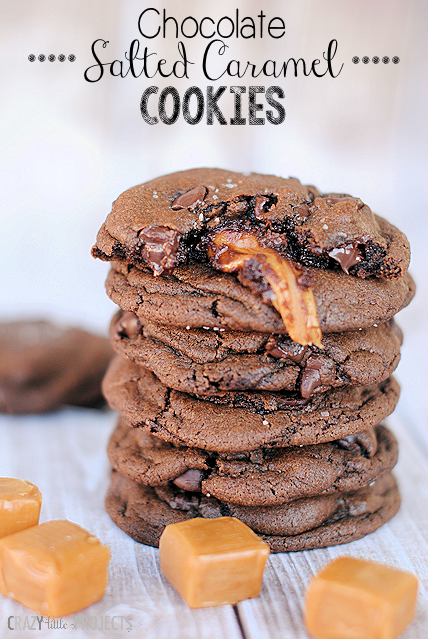 These chocolate salted caramel cookies are as good as it gets! The perfect chocolate chocolate chip cookie stuffed with caramel and sprinkled with salt. They are soft and chew and taste amazing! Cream butter and sugars. Add in cocoa and eggs and mix till combined. Add dry ingredients and mix then stir in chocolate chips. Unwrap the caramels. Roll a ball of dough about 1 to 1 1/2 inches big with 1 caramel in the middle of it. Sprinkle the cookie dough with kosher salt (optional). Bake for 9 minutes (give or take 1 minute but 9 minutes is exactly right in my oven) at 375 degrees on a greased cookie sheet or a cookie sheet lined with a Silicone mat. 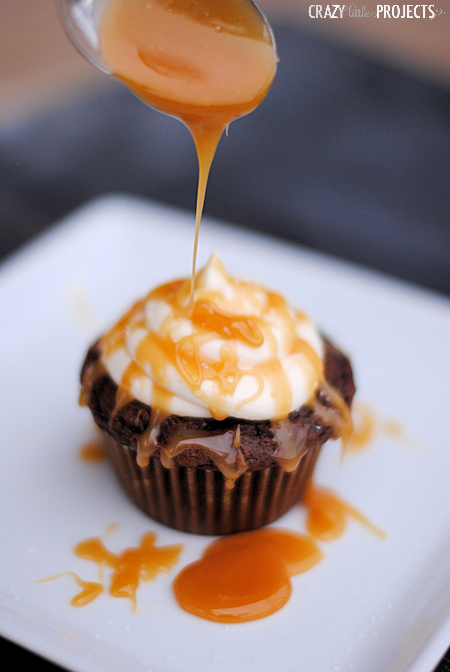 Let these sit for a few minutes to cool, but eat them while they are warm so that the caramel is still gooey. If you aren’t serving them right away, warm them up in the microwave for a few seconds before eating to soften the caramel. So so so good! Right?! 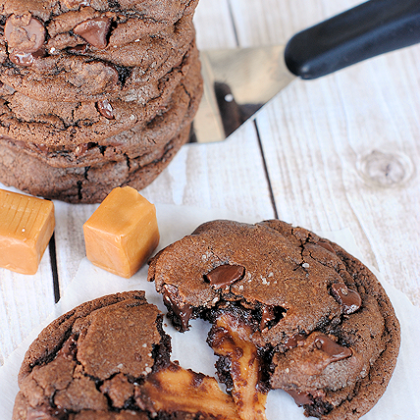 Who else wants one of these chocolate salted caramel cookies right now? Wow Amber these sound and look amazing. I am going to try these – do you have any ideas on conversion quantities for those of us in the UK? Even after all this time we still can’t cope with cups!! I don’t know but I am sure google does. Metric throws me for a loop! What temperature do you cook choc. Chip caramel cookies? Greased or ungreased cookie sheet? Can’t wait to make them. Thank you!! Whoops! Got that added in there! How many does this recipe yield? how many cookies does the recipe make? Would it be ok to double? It makes about 24-30. And yes, you can double for sure! Is that unsweetened cocoa powder? What kind of chocolate chips? Milk or semi sweet? Hi Amber. Thanks for the recipe.. I’m going to try it out.. do you think it’s ok to use salted butter ? will that add in an extra kick to the cookie ? I always use salted butter so you should be fine. Made these this afternoon and they are awesome!!! These will definitely be made again (and again and again)! Thanks for the recipe. This look great!!! I’m actually making them right now! The dough was quite runny and sticky, there was no way I could roll these unto a ball, I added a bit more flour but it was too sticky to roll into balls. I scooped some on a spoon and shoved the caramel in there. Did anyone else have that problem? Yes. I did. and the cookies seem to be just spreading enormously in the oven and getting far too thin, and then they aren’t setting very well! Just realised I forgot to add the flour!! Newbie! I just made these and they were delicious! I don’t know what happened, but more than half of the cookies lost a hole in their bottoms- and the caramel went with it! How should I fix this? I use a Silpat mat when I make them. Do you have one of those? That will help a lot. I have no idea but I will take it! They are sooo yummy!! But mine were completely flat and the caramel didn’t melt. I have some dough in the freezer so I’ll be baking then later. What should I do different? Sounds like you needed more flour. And make sure you are baking them at the right temp. Thank you,I will try to do it. I never tired of cookies, These cookies looks awesome! Just made these yesterday and they turned out so delicious! Instead of using soft caramels we put Rolos in the center which worked just fine. Thanks for the simple and awesome recipe! That’s weird! I just double checked the recipe and everything is accurate? Do you think the Kraft Caramel Bits would work? Can’t wait to try this cookie recipe!!!! how much flour is that 1/2 cup or 1/4?